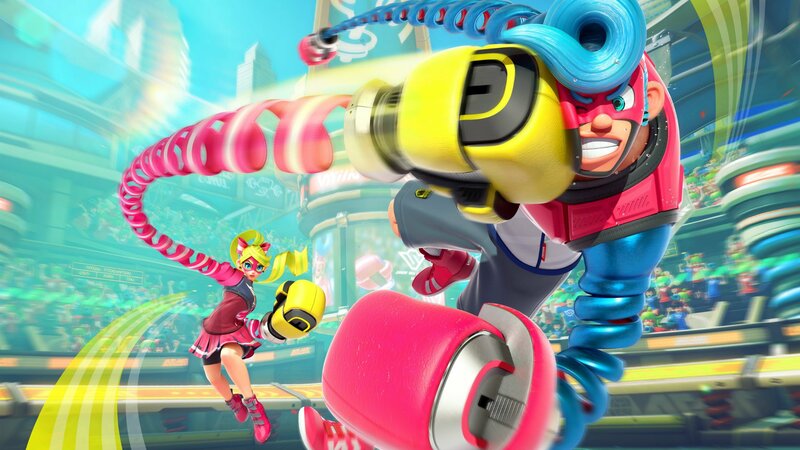 There's been a lot of buzz around the internet regarding Arms, the zany new fighting game coming straight from the brilliant minds over at Nintendo. It's safe to say that the game is very different from other titles in the genre; namely, players use both Joy-Con buttons and motion control to command characters with unusual spring-like arms as they duke it out from an over-the-shoulder perspective across sprawling 3D arenas. The game will offer both one-on-one as well as two-on-two battles, and players will be able to customize their strategies using a number of different gloves. Nintendo has showcased Arms in two different Nintendo Direct presentations so far, and the presentation slated for later today will likely be the last bit of information we'll get before Arms releases for the Nintendo Switch on June 16. Until then, we've put together this handy guide on everything we know about the game so far, and we'll update with further information once it becomes available. 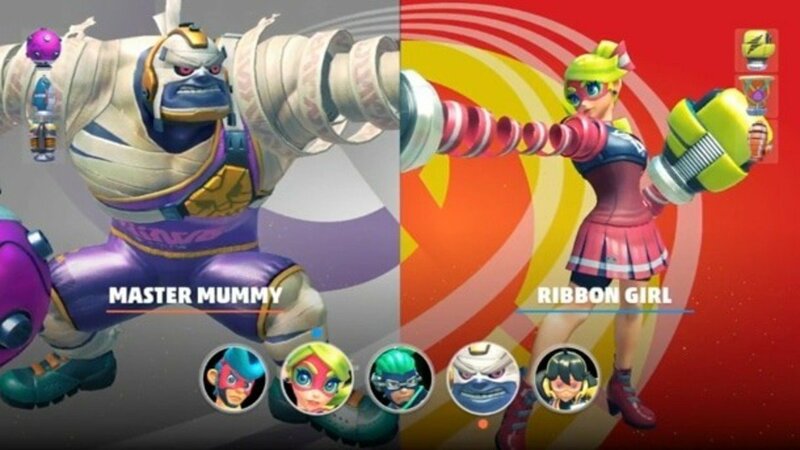 Arms for the Nintendo Switch will land with five available characters: Springman, Ninjara, Master Mummy, Ribbon Girl, and Mechanica. Additionally, each character has its own distinct advantages: Springman is the all-rounder, well-suited to about any situation; Ninjara is able to vanish in an effort to dodge enemy attacks; Master Mummy has additional armor and can heal while blocking; Ribbon Girl has higher movement speed and agility than the others; and Mechanica can jump several times as well as fly around arenas. Nintendo also revealed an additional character in the April 2017 Nintendo Direct Presentation. Named Minmin, the character appears to have arms made out of ramen noodles. For now, her special attributes remain unknown. Several of the available gloves have also been demonstrated: there are gloves that charge up for fire attacks, giant gloves that deliver pure physical damage, boomerangs that negate any environmental advantages, electrically-charged gloves, and also rocket-powered revolver-type gloves that deliver rapid-fire punches. Furthermore, the many of the different gloves deliver attacks from various elemental attributes, like fire, ice, explosion, electric, stun, blind, and wind. It might not be obvious from watching videos of the game, but Arms utilizes a basic strategic element that's partially inspired by the classic game Rock, Paper, Scissors. Namely, each attack type in Arms has another attack that it is strong against as well as one that it is weaker against. These attacks includes grabs, which can be broken by punches; blocks, which can be broken by grabs; and punches, which can be broken by blocking. These offensive maneuvers are further offset by defensive maneuvers: characters can move side to side, jump in the air, dash away from attacks, and in the case of Mechanica, fly. Seeing as how Arms is a top-tier effort from Nintendo, it is expected that the game will cost the full retail price shared by other Nintendo Switch games: $59.99. The game also currently has its own Nintendo eShop page, which suggests more digital-oriented players will be able to purchase the game digitally if they choose. 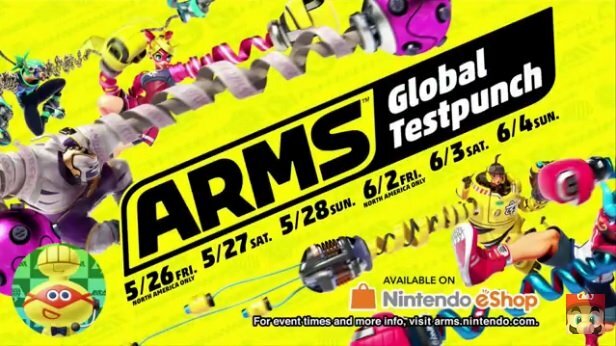 Lastly, Arms is set to release on June 16. Nintendo's most recently Direct showcase is over, and loads of new information regarding Arms was presented. For the first time, Nintendo revealed the entire ten-character roster for Arms, including newcomers Kid Cobra, a stylish skateboarder fond of the Coolerang; Helix, a gelatinous character who can stretch his entire body; Twintelle, a movie star who uses her hair in leiu of her arms; and Byte and Barq, a robotic police officer and canine combo who can team up for special attacks. The Nintendo Direct also detailed some of the gameplay modes available within Arms, including: Fight, which pits players against one another in one-on-one action where items like bombs and potions are dropped into the arena; 2-on-2, where teams of two players are chained up to their teammates and must defeat a similarly-chained pair of opponents; V-Ball, which is like volleyball if the volleyball was replaced with a bomb; Hoops, where characters can shoot and dunk one another into a basketball hoop; Skillshot, where players will break various moving targets; 1-on-100, a survival-like mode where players continuously fight a barrage of fighters; and Arms Test and Training, where players can refine their skills and practicing using some of the game's many various arms. Nintendo also showcased the game's Grand Prix mode, explaining that the main campaign will see fighters taking on ten different fighters across matches with a variety of rules. They also detailed Party Match, which are Arms' online party modes. Party Match will include support for up to ten systems with up to two players each, meaning 20 total players can be put into a single party. Also briefly explained was Ranked play, which is fairly self-explanatory. Nintendo closed out their direct presentation with a promise that new fighters, stages, and arms will be released for the game, and that all planned releases will be free. Lastly, keen players will be able to visit the Nintendo Switch eShop for the chance to check out demo play of Arms, the given dates for which can be found below. This rticle updated to reflect new information from the latest Nintendo Direct on May 17 at 3:30 p.m. PT. There's even more Nintendo Switch goodness to be found in the titles featured on our list of the Best Nintendo Switch Games.